People who care about the future of tropical rainforests, should be aware that the production of palm oil has been growing rapidly in past decennia and simultaneously vast forest areas have been eradicated. Palm oil is being processed as an ingredient of much foodstuff, cosmetics and cleansing agents, under the label of “vegetable oils and fats”. More than 50% of all products in any supermarket contain palm oil or its derivatives. As an increasing part of the world’s population cross the poverty line, more people will get access to these products and the process of destruction of rainforests will continue with accelerated speed. If no restrictive measures are taken, worldwide demand will grow from 56 to 78 million tons in the next 5 years. This phenomenon brings about a tragic loss of habitat for unique species like the orang utan and the gibbon. Beautiful animals like the Asian elephant and Sumatra tiger are as good as extinct. In addition this process of devastation has caused severe environmental and social problems in the regions concerned. 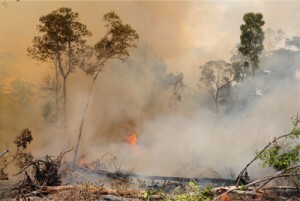 It is anticipated that within 20 years all of Sumatra’s and Borneo’s primary forests will have disappeared completely. About 86% of world palm oil production originates from Malaysia and Indonesia. It is absolutely undeniable that the creation of new palm oil plantations in these countries is the main cause of the continuous cutting and burning of tropical woodland. The kernels of the oil palm have to be crushed and squeezed immediately after harvest. This process produces much waste liquids and biomass, which often is discharged in nearby rivers. Here it decomposes, causing fish mortality and depriving local residents of a source of protein. In order to keep rodents out of palm oil plantations, pesticides are applied, which kill as well other animals. Furthermore poisonous chemicals are being used against fungi and specific insects. The Round Table on Sustainable Palm Oil (RSPO) essentially serves the interests of palm oil producers, processors, banks and traders. The organisation has not played a significant role with regard to the protection of tropical forest areas. Actually, even though it claims to have the ambition to do so, it doesn’t have the required leverage. This is illustrated by the fact that only 18 percent of total palm oil production is RSPO-certified. The disastrous eradication of tropical rainforest in Malaysia and Indonesia goes on with unprecedented speed, causing great socio-economic and environmental problems, depriving unique species from their habitat and turning precious bio-diversity into barren mono-culture. We raise our voice in order to stop this horrible process and save the few remaining rainforests and its inhabitants. The promotion of palm oil, as the established institutions and organisations do, is the root cause of the problem. Worldwide consumption of palm oil has reached its limit and it is the aim of this campaign to bring about change. We encourage the processing industry to do its utmost in order to reassess its production methods and increasingly rely on vegetable oil from the moderate climate zone.